Double your capacity, grind and polish in on step! 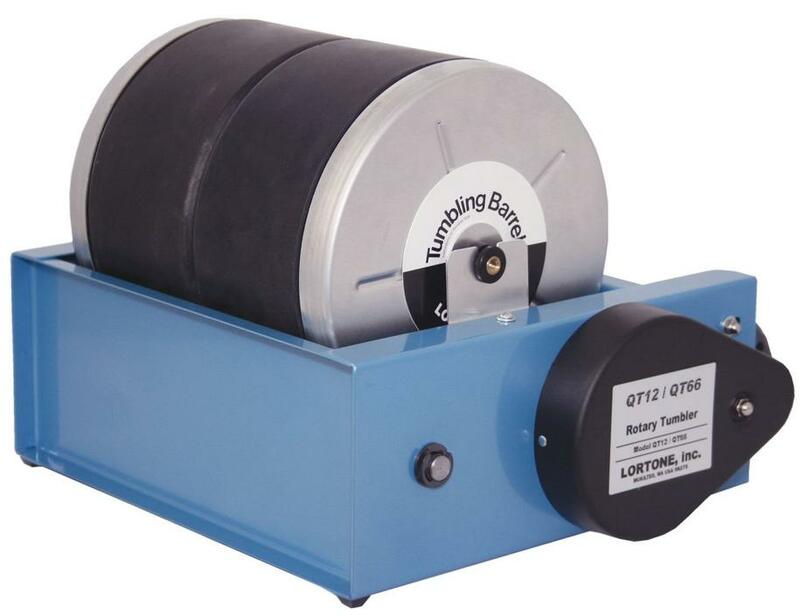 The high capacity Lortone QT-66 Rotary Rock Tumbler features two 10-sided molded-rubber barrels, spun by a heavy-duty motor. Use one barrel or both, for a total capacity of 12 pounds. The double-barrel design lets you use abrasives in one while you polish in the other. It's perfect for polishing rock, brass, castings, beads, glass and more. It's easy to use, even for a beginner, but produces professional results. All-steel body is strong and stable, with a handsome stainless steel drive cover. Lortone quality is backed by a one-year warranty from the manufacturer. Choose Tumbler only or Tumbler + Grit Kit from drop down menu. Kit includes 5 pounds of each: 80 coarse grit, 220 medium grit, and 600 fine grit; plus 1 pound each of Micro Alumina Polish and plastic pellets. Tumbler + Grit Kit ships in 2 boxes. For over 50 years, serious lapidaries have considered LORTONE the standard for performance and durability. Located in Mukilteo, Washington, north of Seattle, LORTONE has a long history of producing high value, economical lapidary and jewelry equipment built to last for many years. Their tradition of using superior materials and workmanship continues, using proven designs, premium steel and quality construction. Whether you're active in cutting slabs or bookends, polishing cabs, deburring metals, tumbling jewelry or beach agate, consider adding a LORTONE product to your rock hound tool arsenal.